Description: A really big one. An RS 36 is handling the switching chores today at Oneonta. Thats Fonda Av, the street FA tower is named for, overhead. Description: D&H had Morrison Knudsen rebuild eight RS 3s with 251 engines and chopped noses. They worked in all kinds of service all over the railroad, and it was not out of the question to find them in yards, such as this one in Oneonta. Description: RW 6 is getting his yarding instructions as he passes through Neawha Park behind an ex LV unit and a couple of B&M units, which were a common sight here at the time. Note the red, white and blue striping on the nose of the first B&M unit. Description: One of the eight D&H Morrison Knudsen rebuilds is on switching duty on a gloomy day in Oneonta. Description: A high/wide load that came in on a recent road freight sits between a couple of yard engines at Oneonta. Description: A pair of Alcos, one and M-K rebuild of an RS 3, the other an RS 36, work at the Oneonta yard. Note the orange ex EL caboose at far right. Description: On the D&H in that era, it was possible have a six unit consist, and no two alike, and most of them dirty. It was a treat to find former LV C 420 413 in clean paint, leading a set of NW units. My friend Jerry got this shot one weekend while up at the farm. Description: A C 420, recently of the Lehigh Valley, rolls into Oneonta yard on a southbound. Description: A walk around the engine facility at Oneonta turned up this classic. Description: A visit to the engine facility at Oneonta on this Independence day netted quite a few units, including this Alco. Description: The Oneonta engine tracks were flled with idle power on the July 4th holdiay, including this RS 36. Description: It's a few years after the Bicentennial, but D&H 506, by now renumbered back from the 1976 it carried during the celebration, still is in its patriotic colors. Description: Not the greatest shot, but shows the blue/yellow scheme some of the D&H power got. 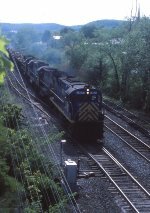 Description: A southbound enters Oneonta, passing Neawha Park behind a mix of D&H EMD and Alco power. Description: The U30's and C628's were gone by this time, but the U33C's rolled on. Here are two at Oneonta. Description: An N&W unit was on hand that day. A friend who lived in Worcester used to see SD45's all the time. The only NW power I ever saw there was GP 9's. Here's one on the engine tracks, with an RS 3. Description: An Alco yard engine pushes for all its worth on a cut of cars at Oneonta. Look at the colorful box cars in the background. Description: A set of power that has just come in off a southbound, probably RW 6, rolls back toward the north end of the yard as it prepares to go into the shop tracks. Description: This photo has a couple of classics. The Alco is always a draw, but check out that box car. Wish I had gotten a photo of the whole car, which was still in full Nickel Plate paint a dozen years after being folded into NW. Description: It wont in a few years. This unit was repainted from its LV scheme fairly early on, but as the years wore on, the paint wore off. Ten years after this shot at the Oneonta shop, the LV red was bleeding through in a big way. Not that any of us minded!! Description: This southbound is at East Worcester, waiting on a northbound. Description: Conrail ran a transfer job from Selkirk to interchange with D&H. Selkirk was the GE capital of the world on Conrail, and any GE was a possibility. Common power in those days was various U boats inherited from its predecessors, such as this U30B. The U30 would not last much longer-it would be gone in a year or two-but the U23B it was coupled to would last into the 1990's. Description: A pair of D&H units, an RS 36 and an ex Reading GP39-2 enjoy the company of a Conrail visitor outside the D&H engine house. Description: D&H power could look handsome when clean, as this RS 11 attests. Description: Looking a little worse for wear, the D&H RS3m that was painted red white and blue still holds its colors five years after the celebration. Like the previous year when I saw it at Oneonta, iit's July 4th. Description: The sun angle favoerd shooting east, so heres the northbound about to pass under the intermediate signals at the top of Richmondville Hill. Description: While the road freight behind the four Alcos waited at Cobleskill, this local passed on the siding there. Description: A chop nose RS 11 leads a work train at Cooperstown Jct. Description: A southbound D&H train seen from NY 7 near Otego. Its into the Guilford era, so an ex CR GP 40 is leading, but the trailing power is what youd expect from the D&H. Check out the D&H gon head out. Description: A southbound on the D&H behind a solid set of blue units-though the lead engine is really the wrong shade!! Description: There were two sets of consecutive units on this train. The leaders were a pair of U23s, now a pair of ex Reading GP 39s. This was a typical power set in the mid 80s. Description: When Guilford took over the D&H, they moved much of the power around their roster, with the D&H units being most affected. An example of that is the two units leading this train. Once D&H U23Bs, they are now lettered for the Maine Central. It became a sore point at the D&H that Guilford kept all the newer power when it let the D&H go in 1988. Description: There had been a disruption on the B&M Connecticut River line, and trains were detouring over the D&H from Montreal via Mechanicville and E Deerfiled. One of the detour trains rolls through Mechanicville en route to Mass. The consist has a couple of unrebuilt RS 18s too. Description: These untis were rebuilds from MK in 1980. This one must have been repainted shortly before this photo. Its way too clean! !